We continue to witness violent attacks – bombings and murders in France, Germany, Turkey, Afghanistan and Iraq; fighting in South Sudan and the continued civil war in Syria. These conflicts have renewed interest in the global refugee crisis and the movements of displaced persons around the globe. The United Nations Human Rights Council announced in June that 65.3 million people were forcibly displaced from their homes in 2015. This is a record number and is equal in population to the U.K. or France. People who have been forced to leave their homes, their nations and occupation against their will are often referred to as “displaced.” And 65.3 million is a lot of displaced people. 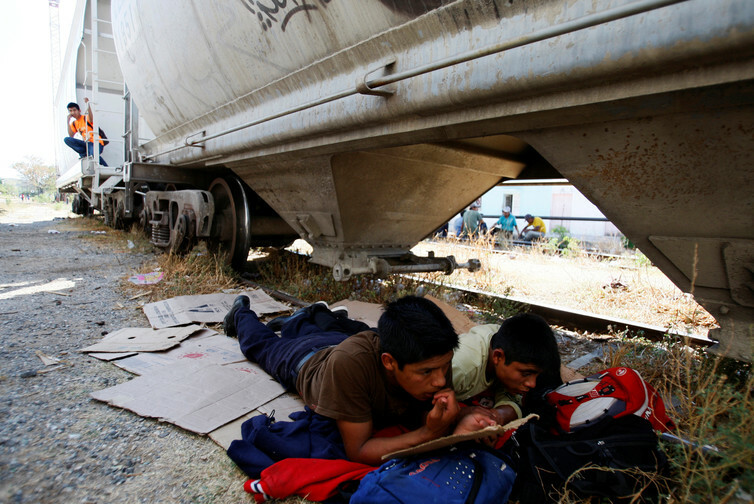 They are found across the globe in response to crises that range from the social to the environmental, and include Syrian refugees fleeing civil war, Central American children crossing international borders to reach family and security in the U.S., Colombians moving internally to avoid warfare and violence and Filipinos who are forced to relocate in response to changing climates and environmental disasters. The UNHRC’s report identifies important global patterns that we must acknowledge. But, the overwhelming size of the displaced population reported confounds a complex issue and creates new fears. The numbers overwhelm and make it difficult to define potential solutions. In our book, “Cultures of Migration,” we argue that all migrants, including refugees, face conflicts and insecurities. Conflicts and insecurity can be physical and violent as in the Syrian civil war or nonmaterial and discriminatory and based in social and cultural differences. These nonmaterial challenges included those faced by migrants and refugees as they settle in Europe and the U.S. Insecurity complicates migration, and migration is no longer a decision made to in response to finding a good job or access to high wages. Migration, forced or otherwise, is complex and challenging. There is no guarantee of success, and over time new conflicts and insecurities arise. Displaced people, like all migrants, balance conflicts and insecurities at places of origin and of destination. Two examples help illustrate our point. Since 2011 Syrian refugees have fled violence and civil war. Yet their desire to leave has a long history, and reflects dissatisfaction with the Assad regime, restrictive national laws and a weak economy. In Sudan, refugees fled their homelands to escape violence during more than 40 years of civil war between South and North over food, natural resources, religion and political control. In 2013, a new civil war in the south brought a crisis, creating more than one million refugees fleeing the violence associated with the political struggles between competing strongmen. Thinking in large numbers abstracts the challenges, conflicts and insecurities that displaced people face. About half of the world’s refugees are living under the UNHCR’s mandate and protection in Afghanistan and Somalia. Nevertheless, it is people fleeing smaller crises like the coup in Turkey, the drought in Central Asia and religious persecution in Myanmar among others that make up many of the displaced. In addition, more than 40 million refugees remain within their native homelands, including Colombians, Iraqis and South Sudanese who are fleeing their villages to escape violence, warfare and religious persecution. How do we comprehend 65.3 million displaced people when they have little in common? 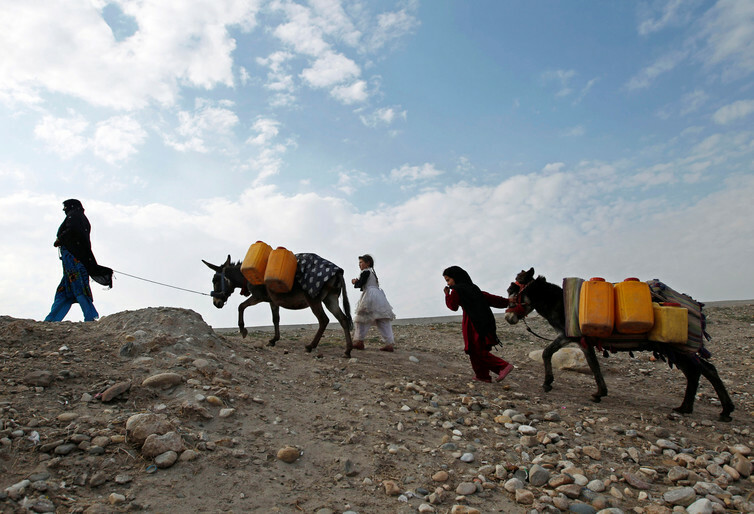 An internally displaced family in Afghanistan transporting water. To cope, we use metaphors in place of statistics. Often, displaced people are described as waves crashing upon the beach or spreading like a cancer. Critics who exaggerate the numbers of displaced people and refugees overwhelm and terrify their audience. Donald Trump, the U.S. Republican presidential nominee, warns U.S. citizens to lock their doors, lest they fall victim to terror. Milos Zeman, the Czech president, describes the movement of refugees to Europe as an “organised invasion.” These arguments deny the realities that the displaced and refugees face and prey on a shared fear of outsiders. “Good” refugees are the people who flee their homelands to avoid violence and seek shelter and a new way of life. “Bad” refugees threaten our shared values and lifestyle. Politicians question the motives of Central Americans entering the U.S.
Knowing the numbers of displaced people globally captures the size of the crises driving people from their homes. However, it is more important to focus on the conflicts and insecurities that define specific crises. By identifying the causes of forced relocation, we can better address the outcomes and build toward solutions.